The pencil has a soft triangular barrel. Some people aren't fans of 3 sided pencils, but I am increasingly getting more and more into them. I don't hold a pencil properly, basically everything is moved down a finger. So I hold a pencil between my thumb and middle finger, and it rests on my ring finger. The index finger acts more as a second guide that sits higher up on the barrel. I think I do this so I don't have to curl my ring and pinky fingers as far into my palm to get the writing angle I'm comfortable with. Anyway, I have been holding writing instruments this way for as long as I can remember and have never had any problem with fatigue. It seems these triangular barrels, and these pencil in particular, are geared toward teaching people the proper way to hold a pencil. There's even a hand using proper technique on the front of the box. 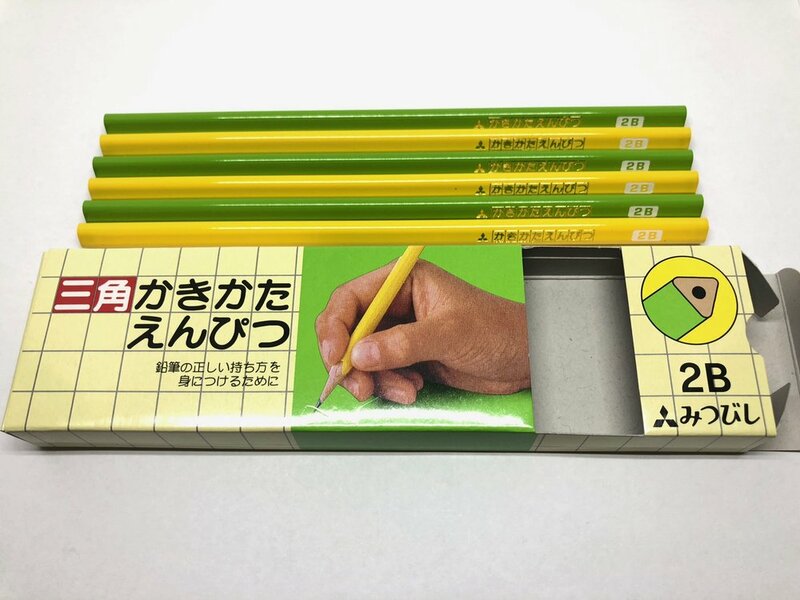 Inside that box are 2 different colors of pencil: 6 yellow and 6 green. These are a bright yellow and a light grass green. Very primary colors. That leads me to believe that these are somewhat marketed towards schools and children learning to hold a pencil properly. Along the 3 sides: one is blank, one is imprinted in gold with Japanese characters and has a 2B pill in white, the other just has the 2B pill. They're unfinished on both ends. No ferrule and on factory sharpened. The wood has a nice cedar smell and sharpens beautifully. I love how the collar of a triangular pencil looks, with those nice, swooping areas up near the paint. 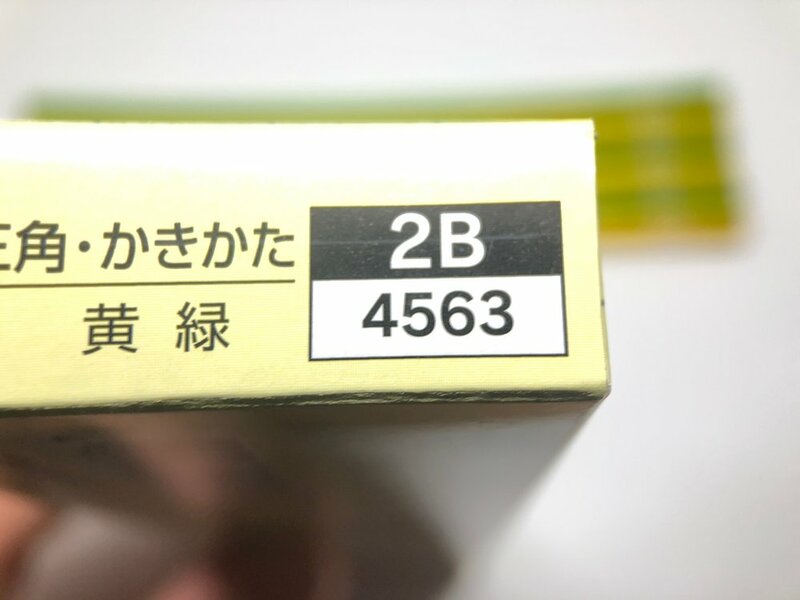 The core is 2B, and with this being Japanese, it is very soft. All it takes is a light touch to make a dark mark. Point retention is about what you'd expect on a soft pencil. With a good eraser, words come off cleanly. Overall, I'm a fan of this one, but there isn't any real WOW factor with this pencil. It writes well, it's got a cool shape, but I don't think I'd use it as my triangular pencil of choice. I still save that designation for the DOMS Groove Slim, which has a bit better point retention and a pretty dark mark, though not equal to this Mitsubishi 2B. Available from Amazon, $6.18 for a box of 12 at post time.